'Heat not burn' or 'heated tobacco' products are electronic devices that, unlike e-cigarettes, contain tobacco leaf and heat it to a high temperature, without setting it alight. This difference is important. Because the devices contain tobacco, they come with all the long-term health concerns of tobacco. And with the tobacco industry investing heavily in research, development and marketing of these new products, understanding what's in them is vital. So how do they work? And are they safe? We caught up with Dr. Ed Stephens, a researcher at the University of St Andrews, whose work has compared the health impact of tobacco, e-cigarettes and heat not burn products, to find out more. Heated tobacco products work by using electricity to heat sticks of tobacco, producing a vapour that's inhaled. The vapour contains nicotine, chemicals and other tobacco particles that are also found in traditional tobacco smoke. "I don't like the term heat not burn," says Stephens. "The word 'burn' has two meanings. The first is to light something so that it catches fire and continues to combust until the fuel runs out, like a candle or a cigarette. The second is to heat something until it chars around the edges – like when you leave a cake in the oven for too long and it chars. Switch the oven off and the charring stops. Heat not burn products don't burn like a cigarette, but the tobacco is 'cooked' and may even char. So it would be better called heat not combust." The devices heat tobacco to 350C (662F), far lower than traditional cigarettes that burn at temperatures up to 900C (1,652F), but still high enough for harmful chemicals to be released into the vapour. There's some evidence, largely from research funded by the tobacco industry, that heat not burn products may be less harmful than smoking. Studies suggest that the vapour from the devices contains lower levels of harmful chemicals compared to cigarette smoke. But those chemicals were still present at higher levels than usually found in e-cigarettes. And importantly, unlike nicotine replacement therapies or e-cigarettes, heat not burn products still contain tobacco, so we don't recommend people start using heated tobacco products. "They are tobacco products and we do know the long-term effects of tobacco, including at least 15 types of cancer," says Stephens. It's too soon to know how using heat not burn products will affect someone's health in the long term. Research looking at these tobacco products is still in its early stages and is mostly funded by the tobacco industry, rather than independent researchers. This means the results may be less reliable, as the tobacco industry wants to promote their new products and has a long history of distorting their harm. 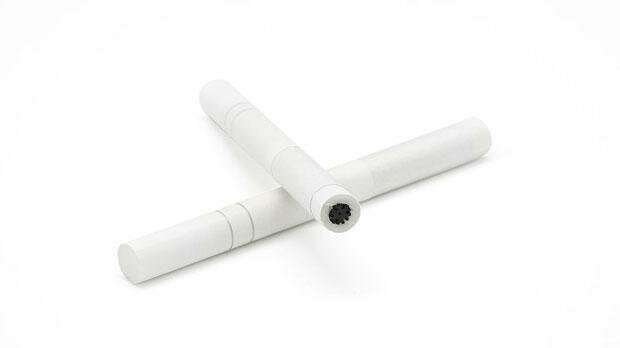 Is heated tobacco the same as an e-cigarette? No. The big difference is that heat not burn products contain tobacco leaf, whereas e-cigarettes don't. On top of that, e-cigs don't always contain nicotine. But heat not burn products always will. There's a lot of evidence to suggest that e-cigarettes are far less harmful than smoking, as well as having the potential to help people quit smoking tobacco. But this evidence isn't there for heated tobacco products. Can heated tobacco help people quit smoking? So far there's no evidence that switching to heated tobacco products helps people to quit cigarette smoking. If you're looking to stop smoking, or stop using any form of tobacco, you're around three times more likely to quit using NHS Stop Smoking Services compared to going it alone. These services can discuss the different options available and provide support to give you the best possible chance of quitting. If medication hasn't worked for you in the past, they can also help you try an e-cigarette to quit. How popular is heated tobacco? In 2017, it was estimated that 1.7% of adults in Great Britain had tried a heated tobacco product. This compares to 19% of adults who had tried an e-cigarette. "In a country like Japan, use of heat not burn products is relatively high," says Stephens. "But in Japan, nicotine-containing e-cigarettes are illegal, whereas in the UK they have been actively promoted by public health bodies. This may be one reason that heat not burn is less popular in the UK. They're also more expensive than e-cigarettes, and much newer to the market." But Stephens warns that the tobacco industry will try to push these products more aggressively all over the world. "The tobacco industry's long-term future depends on the success of heat not burn and e-cigarettes, so they're going to throw loads of money at this in any way they can." Stephens says there are still a lot of unanswered questions about the short and long-term health impacts of using heated tobacco, and that longer-term studies are needed. But even if these products are less harmful than cigarettes, he wouldn't recommend them. "If a relative of mine was a smoker, I would advise them to try the conventional route of nicotine replacement therapy, preferably with support from a Stop Smoking Service, to quit," says Stephens. "And if that didn't work, I'd suggest they try an e-cigarette and seek support at a Stop Smoking Service."